A friend sent me an email with an interesting problem. He had a report he needed to share with another team member, but they didn’t have the program that he used to create the report. There also wasn’t a common file format they used. I suggested he try sending a .PRN file or printer text file. This solution also works if you ever lose your printer at work and need to send files elsewhere to print. Never heard of a PRN file? Don’t worry as most people haven’t. You’ve probably seen references to these files before, but overlooked them. 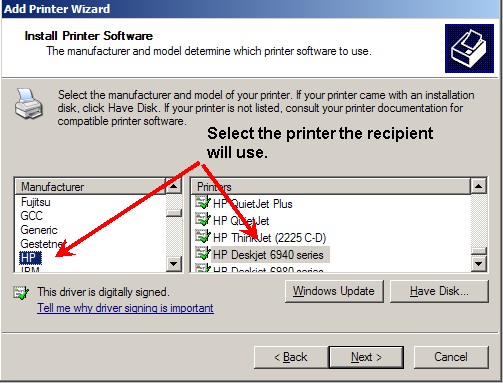 In many programs, the print dialog has a checkbox for Print to file. Rather than sending the file to your printer, the output is formatted for a specific printer. The result is a file with a .PRN extension that the recipient prints without having to have the application that created the file. For example, you could print a brochure produced in Microsoft Publisher without having that software package. Although creating a PRN file is easy, there are two questions you need to answer. Can your software print to a file? 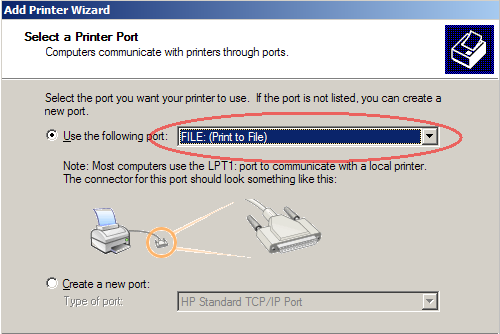 Open your program’s print dialog and look for a checkbox called Print to file. Many programs have this feature. Do you know the make and model of the recipient’s printer? It’s essential you know the other printer. Even though you’re printing to a file, the PRN file is formatted for a specific printer. If you selected an Epson Stylus Photo 870 and the recipient had a Dell Color Printer 725, the file wouldn’t print properly. Just as important, you need to install the same print driver on your computer. Some of you may be thinking that you need to have the same printer as the recipient. Relax; you don’t need the printer, only the print driver. If you’ve ever created an Adobe Acrobat file or files for your graphics vendor, this process will seem similar. From your Start menu, select Printers and Faxes. From the File menu select Add printer. Select Local printer and deselect any detection options. As you move through the Add Printer Wizard, you’ll see a long list of manufacturers and printers. Odds are you’ll see the printer your recipient uses. If not, you’ll need to download the printer software from the web. Step through the rest of the print wizard. Since you don’t physically have the printer, don’t print a test page or set up sharing options. The easiest part in this process is creating the PRN file. 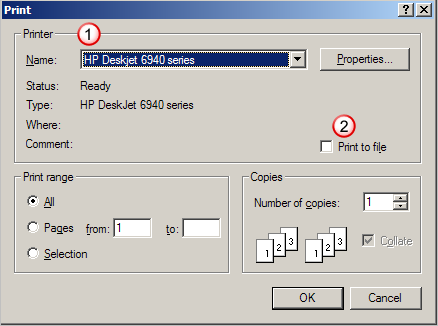 The process starts by opening your program’s Print dialog. Generally, there is a Print option on the File menu. Select the printer the recipient uses. Check the option for Print to file. Set your other print options. One thing to remember is you can’t do much with a PRN file except print it. If you tried to double click, Windows would complain that it doesn’t know what application to use. If you opened the PRN file with Notepad or another editor you’d see gibberish. At this point you’re probably thinking you’re done. After all, you sent the PRN file as an attachment to your team member in Hong Kong or wherever. The recipient may need help on how to print the PRN file. There are two ways to print the file. One way is by using DOS commands and I don’t want to take you down that path. Instead, I’ll suggest a free print utility from Russ Wright called PrnPrint. 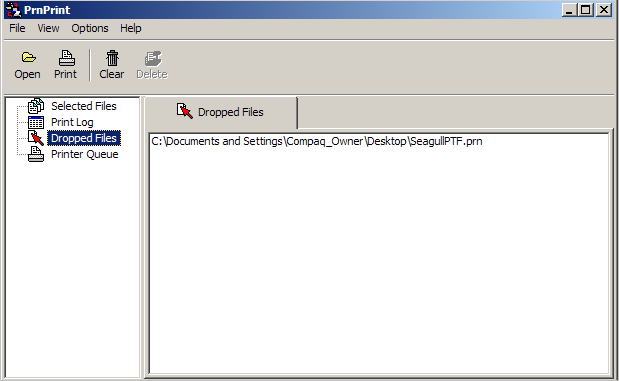 It’s a small program that allows you to open and print PRN files. Or, you can drag and drop files to a staging area. Update: I removed the link above for Russ Wright as the site has gone offline and I have yet to find a reliable source. It’s hard to say how often you’ll need to use PRN files. I’ve probably used them a dozen times. Each time they’ve saved me or someone else from installing software. It may not be a solution you use often, but you’ll be glad to know it exists.